Bella Klapprich, Border Days Princess, will be a senior at Grangeville High School this fall. GRANGEVILLE — “This has been one of the most amazing experiences ever,” 2018 Border Days Princess Bella Klapprich said. 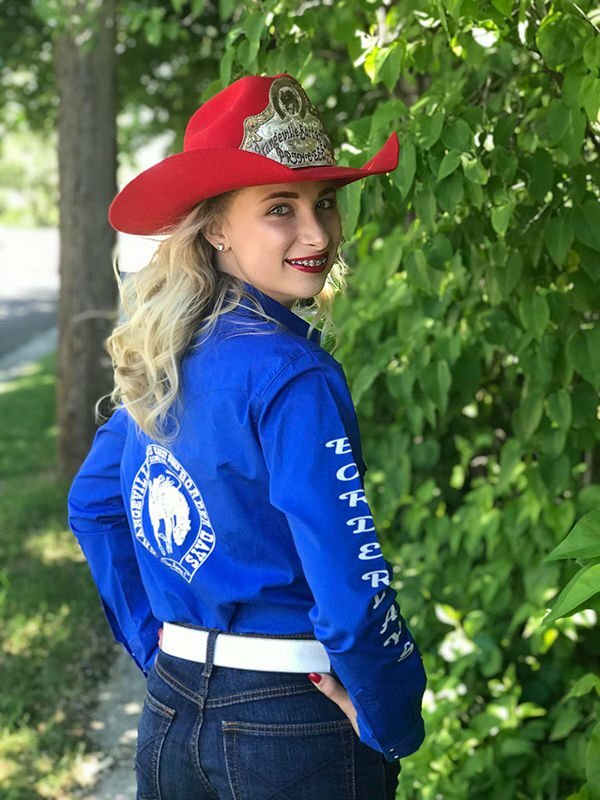 “To represent Idaho’s oldest rodeo and such a gracious community has been an honor.” Klapprich, 17, is the daughter of Melissa Miller Klapprich and Bilejo and Lindsay Klapprich, all of Grangeville. She is the granddaughter of Rick and Mickie Miller of Grangeville and Judy Klapprich and Lloyd Uhlenkott of Cottonwood. “We have met so many amazing people, started new traditions for our hometown, traveled and involved ourselves in every event, and I’ve gotten to do it all with one of my best friends,” Klapprich said of her experience with Queen Micaela. “It’s something I will never forget. Klapprich has a passel of siblings who have cheered her on this year, including twin sister and brother Demi and Tate, 14; sisters Elli, 12, and Julia, 7; stepbrothers Mason, 14 and Gavin, 6; and half-brother, Liam, 1 month. She has played volleyball and basketball in high school, is a member of Animal House 4-H Club and has been a member of Grangeville’s Triple Bar Drill Team for the past six years. She has tap danced for Shirley’s Dance Studio for 14 years and works at Grangeville Health and Rehabilitation. Klapprich is no stranger to royalty as she served as 2016 White Bird Rodeo Queen, 2015 Riggins Rodeo Queen and 2014 Triple Bar Drill Team Queen. “Being royalty is a wonderful opportunity to represent one of the best sports in the world,” she said. “There’s no other experience like it and it helps build self-confidence.” Following high school, Klapprich plans to either pursue dental hygiene in Boise or nursing at Lewis-Clark State College. “A big shout out to my mom and my second mom, Amy . They have been with us every step of the way and have eaten more glitter than a human should,” Klapprich laughed. She also thanked her Nana, Papa and Aunt Kami for their support, as well as chaperone Anna Wren and Queen Micaela. “Thanks for making this year so much fun – from rodeos, community fund-raising and tricycle races, we have had the best year ever,” she smiled.